Some pets love it, some can't stand it. 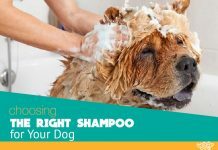 Choosing a perfect shampoo for your dog is no easy task, but you will find one that suits your pet's needs in no time. Let's see our top picks! Watching our furry pets play around to their heart’s contempt can be such a beautiful and fulfilling experience. When you want to relax and get rid of the stress that you experience during your busy working day, playing with them can make you forget everything else and ease you into pure joy. A well-known fact for most owners is that once the outdoor playtime session is over, some serious cleaning is required to get rid of dirt and filth that fur quickly collects. Plenty dog hygiene products on the market can keep your furry pal pristine clean and odor free. Whether you use shampoos or conditioners, you can be sure that they will maintain the fur clean of filth and also healthy looking. Just remember not to bathe your pooch too often as it can remove natural oils from the coat and sometimes even cause skin issues and allergies. Here we have a list of reviews of some of the top rated dog shampoos and conditioners that are the choice of both professionals and regular owners from around the world. If you want only the best care products for your pet, then these items are very well worth your attention. If you’re in a hurry check out Earthbath All Natural Shampoo: It’s made of completely natural ingredients which are all irritation free and cruelty-free. All natural care products make sure that your pet stays healthy and thoroughly clean while at the same time nourishing both fur hair and skin. If you have a pet that is sensitive to other types of care products, then organic base care is the sure way to go. When you need your furry four-legged friend completely clean while still keeping it free from allergies and skin issues, All Natural Shampoo from Earthbath represents an excellent choice. Its ingredients feature a combination of irritation free effects which means that your dog will never experience discomfort during bathing sessions. It is an excellent choice if you want a care product that is gentle and very effective at cleaning incredibly well. Earthbath’s All Natural Shampoo is effective up to a certain degree of filth found on your pet’s fur and skin. Depending on overall length and hair density you will struggle to get it all clean so have that in mind before purchase. For short length fur and sensitive skin, it works wonderfully, and best of all smells great after each bath! Wahl is a well know manufacture of many hair care products, so it is no wonder that it also has a fur shampoo in its vast product portfolio. It uses a natural formula that relies on only natural plant based ingredients that take good care of your pet’s coat and skin. The main ingredients are Aloe Vera, oatmeal, lime, coconut and lemon extract which are known for their soothing effect. Wahl’s Natural Shampoo combines all the benefits and advantages of an organic product in a single attractive and affordable package. It takes just a small amount of it to lather into a soapy volume that will get your dog clean and stink free in no time. While the scent choices aren’t that great in our experience, your pet will certainly not object to the positive change! If you have a canine that enjoys playing outdoors so much and doesn’t mind to get all covered up in mud and other types of filth, then you need effective cleaning solutions. When nothing else cuts it, heavy duty dog shampoos are the only reasonable choice for strong odor. No matter the amount of dirt you need to clean from your pet’s fur these products will easily regain them to a clean and beautiful smelling state. With an unusual mix of effective cleaning ingredients, Veterinary Formula Shampoo touts triple strength effectiveness that can get rid of even the stickiest and smelliest spots of filth on fur and skin. It doesn’t mean that it packs harmful ingredients and chemicals and on the contrary, it is very hair and skin friendly mix of ingredients. Since you’re looking to buy it because of the cleaning power, we suggest that you pay attention to the specifications first just to be safe. It performs great when you need maximum cleaning effect for your very dirty furry pet. If your pet isn’t prone to allergies and doesn’t have sensitive skin, you can use this care product to get rid of every bit of filth and foul odors. It will quickly restore its fur back to a clean and shiny state. If you want to get rid of bad smell and the in particular “wet dog” one, then you should look no further than BarkLogic’s Natural. Purposely designed to use natural ingredients for powerful cleaning effect, it will quickly remove any sort of dirt and foul odors that usually come along with it. The scent is present even after hours pass after the bathing which shows a high effectiveness of ingredients in this formula. BarkLogic certainly has a winning cleaning formula on their hands with their Natural Shampoo. It is beneficial for cleaning and excellent for removing stench and foul odors from your pet’s fur and skin. While we wish that it came with a bit lower price tag and better lathering performance we cannot fault it given its incredible cleaning results. 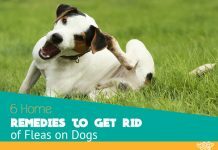 It is not uncommon for dogs to suffer from numerous allergies and exhibit easily irritable skin syndrome. Unsurprisingly, some of these unfortunate indications appear due to the environmental conditions while some affect pooches’ health because of use of care products with high toxicity chemicals. For their owners, this usually means to avoid using conventional types and instead turn to hypoallergenic products that soothe sensitive skin and prevent the appearance of rashes and any discomfort. Boasting an ingredient mix that prevents adverse effect on the sensitive skin, Vet’s Hypo-Allergenic Shampoo uses a gentle formula for best bathing results. It works wonders and even prevents irritation to the eyes to make your pup enjoy each cleaning session. By using Aloe Vera and Vitamin E, it also moisturizes and soothes the fur and the skin which leaves your pet looking great after every bath. We like using Vet’s Hypo-allergenic shampoo since it does what it says almost perfectly. While we didn’t expect that it will keep the fleas away, it isn’t a disadvantage since essential oil scents tend not to last very long. Cleaning performance is surprisingly good even when they get covered with plenty of dirt. The soothing effect indeed stops skin irritation and rash which is the whole point and primary function of this great product. Certification is always welcome for products that need to be gentle and delicate on the sensitive skin type of pooches. The 4-Legger Certified Organic shampoo uses all natural formula that makes the best use of complete vegetable base ingredients for maximum soothing effect. It uses Aloe Vera, coconut, olive and jojoba oil that not only moisturizes fur hair, it also leaves it soft and shiny after each bath! We were pleasantly surprised with the performance of 4-Legger Organic, and it even exceeded our expectations. It lathers very well for this type of care product and leaves your pet smelling good for hours after each bathing session. There were no signs of skin irritation and rashes which mean no more scratching and itching for your pooch. Combo products that include both shampoo and conditioner effect not only represent great value, they also decrease the bathing time you need to spare to recover your pet into the clean state. By mixing formula of two individual care ingredients, you get all the cleaning effect you need for your furry pal in one single and convenient package! Manufacturer Pro Pet Works makes one of the best combo products currently available on the market. It keeps the price affordable while maintaining the top quality of ingredients and performance. The completely natural vegetable base formula works wonders for both cleanliness, scenting and moisturizing after each bath! Honestly, you just can’t go wrong with Pro Pet Works! It is perfect for use on all furry pets and shows great results with every use. We like how it leaves the skin and fur coat soft and lush which was completely unexpected from a combined ingredient formula product! When you consider the fact that it is affordable and includes two types of products in one, you simply cannot resist from going for it. Trust us; your pet will be very thankful to you for making the switch! Conditioners are in essence, care products that can repair damaged hair fibers, bring back the fur shine, add a sweet scent and keep the natural oils in balance which means no irritation and broken hairs falling out. It is advisable to use them after each bath for best results. Using a combination of shampoo and conditioner keeps your dog looking great and also protects it from all types of contaminates that can cause allergies and skin irritation. The trademark of Isle of Dogs Conditioner is the dominant scent and grooming effect that makes your dog look like a magazine model after each use. You have to see the silkiness shine and softness effect that it has on the fur in person to believe it! Because it uses chemicals that can potentially harm your pet if it is a sensitive skin type, you should make sure that there are no adverse reactions after the first use. If you visit competitions or simply like to make it look in the best way possible, then this just might be a perfect conditioner choice. It performs great, leaves a lasting pleasant smell and makes its fur feel very soft to the touch. The shiny fur hair effect is another advantage which will make other owners turn heads and certainly ask you to reveal your pet grooming secret. An all-natural alternative conditioner uses the organic formula for maximum shine effect and smooth and soft fur. By having no chemical ingredients, FURminator deShedding Ultra-Premium promises to make your pet look beautiful and smell great no matter how stinky it was before bathing. Chamomile extract works wonders to remove foul odors and leave your furry pet feeling fantastic. Aloe Vera and Omega Three and Six fatty acids keep the hair looking shiny and make it feel stronger to prevent breakage and shedding. Of course, this is for times when your pet sheds naturally if it happens often or it’s too excessive you should consult your vet. FURminator deShedding Ultra-Premium works wonders for getting rid of foul odors by using natural ingredients only! We only wish that the pleasant after use scent lasts a bit longer although it is the price of using a completely chemical free formula which is always an advantage. It keeps your pet’s fur looking shiny and amazingly soft all the while feeling great and preventing skin irritation and dryness. As is the case with every other young animal, puppies have very tender and sensitive skin which means that keeping them healthy and clean requires care products that are extremely gentle. We don’t advise that you use any conditioner at their young age and instead stick to a choice of all natural shampoos. Remember not to bathe them too often as that can damage their natural oils and make them more prone to allergies and skin and hair irritation symptoms! If you want the best possible care for your cute pup – Rocco & Roxie Supply Co has a premium quality care product that will keep your small pet clean and healthy. Being Hypoallergenic means that it keeps the skin soft and has a soothing effect on it. It also works wonders for fur and shows great results even on short length hairs. Your little pooch will feel like a soft and fuzzy ball after each use of this specially tailored shampoo for newborn pups. We must point out that this will make a great product even for use with adult dogs too, as we found out during our review testing! Rocco & Roxie Supply Co have a care product that has zero disadvantages and makes both owners and their pets very happy and satisfied. If you don’t mind a bit higher asking price, in return you will get a care item that will keep your pup pristine clean, smelling great and having a shiny and soft coat. Keeping your furry pets clean and free from germs and other contaminants has to be a priority for every owner. Not only will you also keep your home cleaner, but your dog will also be healthier and kept safe from exposure to allergens and diseases. Once you spot that it is itching and scratching it is a sure sign that you need to change your product brand. Every listed item we have in this article earns the right of being the best dog shampoo or conditioner because of their excellent performance during real life conditions testing. You won’t make a wrong choice with either one of these grooming brands and their high-quality products. For more information about dog related products, how to guides and tips – be sure to check out our other articles for more useful information.